Aranea Highwind is a Character in Final Fantasy XV. Imperial airborne division commodore known for captaining a distinct red aircraft as well as a squad of mercenaries. Even in hand-to-hand combat, Aranea is most at home in the skies, wielding a magitek lance in dragoon-style aerial attacks. Combat skills and mechanics, roles and strategies for Aranea go here. 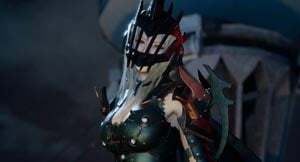 Can we meet aranea after finishing the main story?